The President of Ireland (Uachtarán na hÉireann) is Ireland's Head of State. The Office of President was established by the Constitution (Bunreacht na hÉireann). The President is elected directly by the people and serves a seven year term in office. The current President is Michael D. Higgins, who commenced his term on 11 November 2011. The President of Ireland is elected by the people of Ireland. Every citizen who has the right to vote for members of Dáil Éireann also has the right to vote in Presidential elections and any citizen over the age of 35 can seek nomination as a candidate in such elections. 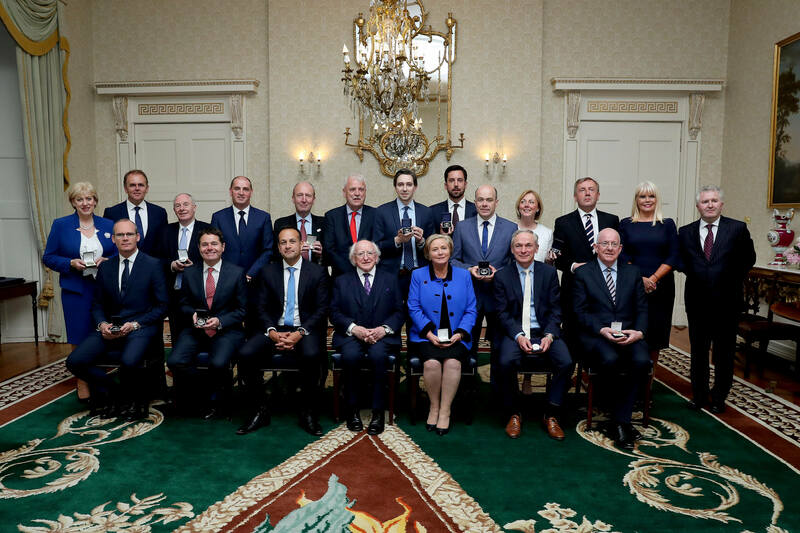 In order to be considered a candidate, a person over the age of 35 must be nominated by at least 20 members of Dáil or Seanad Éireann, or no less than four administrative counties (County Councils). Former or retiring President's may become candidates on their own nomination. The candidate who has won the presidential election becomes President of Ireland by publicly making the oath set out in Bunreacht na hÉireann. The President is inaugurated in St Patrick's Hall in Dublin Castle and makes the declaration in the presence of members of both Houses of the Oireachtas, the Judges of the Supreme Court, the Court of Appeal and the High Court and other public persons. The formal powers and functions of the President are prescribed in the Constitution. Many of the powers of the President can only be exercised on the advice of the Government, but the President has absolute discretion in other areas. Acting as Supreme Commander of the Defence Forces. The President appoints the Taoiseach (Prime Minister) on the nomination of Dáil Éireann; and the other members of the Government on the nomination of the Taoiseach, after Dáil approval. Other office holders appointed by the President, on the advice of the Government, include Judges, the Attorney General, the Comptroller and Auditor General, and Commissioned officers of the Defence Forces. Ireland is a parliamentary democracy. The National Parliament (Oireachtas) consists of the President and two Houses: Dáil Éireann (House of Representatives) and Seanad Éireann (the Senate) whose functions and powers are laid out in the Constitution (Bunreacht na hÉireann). The President summons and dissolves Dáil Éireann on the advice of the Taoiseach. If a Taoiseach no longer has the support of the majority of Dáil Éireann, the President may choose to call for fresh elections, by signing a proclamation dissolving the Dáil. However, the President may also refuse to dissolve the Dáil, in which case members of the Dáil must nominate an alternative Government. Since the foundation of the State, this power of refusal has never been exercised. Following a general election, Dáil Éireann is summoned by the President, on the advice of the Taoiseach. The President must follow the advice of the Taoiseach. In addition, the Constitution states that the President may, after consultation with the Council of State, communicate directly with the Houses of the Oireachtas, by message or address, on any matter of national or public importance. The Constitution (Art. 13.7) states that such message or address must, however, have received the approval of the Government. The President can also convene a meeting of either or both Houses of the Oireachtas. Before doing so, the President must first consult with the Council of State. The President's power to convene a meeting of either or both Houses of the Oireachtas has never been exercised. It might be used in an emergency situation. An overview of the Bills signed by the President can be found here. Bills passed by the Houses of the Oireachtas must be signed by the President of Ireland before they become law. Under the provisions of Article 25 of Bunreacht na hÉireann, a bill can only be signed by the President on the 5th, 6th or 7th day after it is presented for his signature, but there are some situations when the President may sign a Bill earlier. Under Article 25.2.2 of the Constitution, the Government, with the prior concurrence of the Seanad, can request earlier signature, providing the President with the option of signing the bill earlier than the 5th day. The Constitution also provides the President with the power to refer certain Bills to the Supreme Court for a determination as to whether the bill or any provision thereof is repugnant to the Constitution. Should such a Constitutional issue arise, the President must consult with the Council of State prior to making such a referral. The decision whether to refer a Bill to the Supreme Court is the President's alone. The President represents all the people of Ireland, both at home and abroad. To find out more about the President’s role in this regard, click here. The President of Ireland is Supreme Commander of the Irish Defence Forces. Under the Defence Act of 1954, military command is exercised by the Irish Government through the Minister for Defence who manages and controls the forces. The Defence Forces in Ireland consist of the Permanent Defence Force (comprised of the Army, the Air Corps and the Naval Service) and the Reserve Defence Force (a part-time volunteer force). By tradition, the Head of State has been assigned a military ‘Aide de Camp’; a high-ranking officer in the Defence forces whose primary function it is to be in attendance to the President at all official duties and in particular on State ceremonial occasions. There are 2 situations when a President may be removed from office. If five Supreme Court judges or more decide that a President has become permanently incapacitated, the President's term of office will come to an end. The President may also be impeached by either House of the Oireachtas for "stated misbehaviour". Stated misbehaviour might include a criminal offence or a misuse of the President's powers.